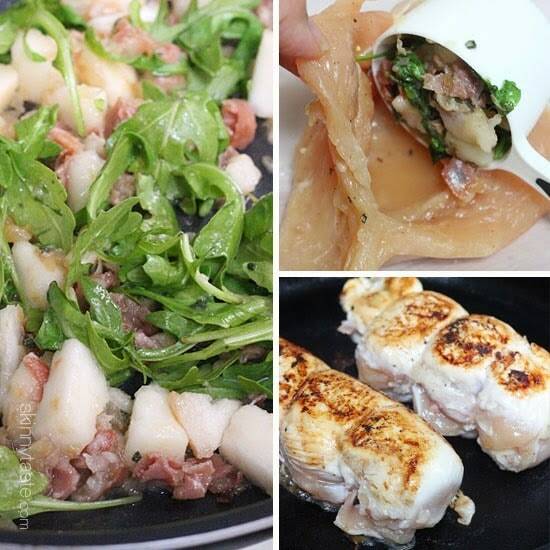 Roasted stuffed chicken breast is the perfect Fall dish, filled with a savory-sweet stuffing of prosciutto, pears, sage, brie and arugula. 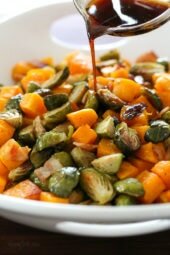 It’s delicious with a salad on the side, but also can be served with roasted butternut squash or brussels sprouts to make it a meal. It also happens to be naturally gluten-free and low-carb. 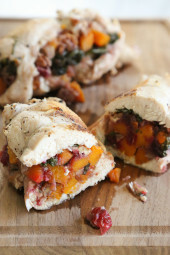 Slice a pocket into the side of the chicken breast lengthwise to create a pocket for stuffing. Heat a skillet of medium heat, add the oil, onions and proscuitto; saute until golden, 3 to 4 minutes. Add the sage and pear, season with a pinch of salt and cook 3 to 4 minutes or until translucent. Remove from heat, and add the arugula. Set aside to cool a few minutes. Heat an oven-proof skillet over medium-high heat and lightly spray with cooking spray. Carefully sear the outside of the chicken on all sides except where the stuffing is until golden brown. To serve, cut each breast in half and serve. I made this dish for a birthday dinner. It was fabulous. Paired it with roasted Brussels sprouts and park rissoti. 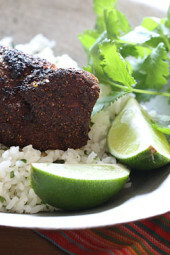 I made this recipe last night and it was soo good! I didn’t end up stuffing the chicken though. Instead I seasoned the chicken with salt and pepper and then grilled it. I followed the pear filling recipe exactly except I added an extra pinch of salt at the end. I butterflied the chicken after grilling it and put the topping right on it with the brie on top. Soo yummy! Making it again another night this week since it’s so easy and I have all the ingredients now. Love your recipes !!! And I gave made this many times nw on a lower carb diet so looking for a side dish low in carbs that would be tasty along with this … any suggestions ? How would I go about getting the directions for this recipe, when I click on the link for the directions they are no longer available? Absolutely delicious! Browned the breasts then covered & simmered till done. They were so good! Maybe next time I would add a little chicken or veggie broth to keep them moister but everyone raved about them! Will def make again!! Thx! Was so excited about this one- but it didn’t come out too well. The filling didn’t fall out- but it sorta just shrunk up when it cooked to the point of there being nothing left. And although we went a little heavy on the brie- I couldn’t taste or see any of it after cooking. One possible tip- My friend grilled hers and they came out much much better. 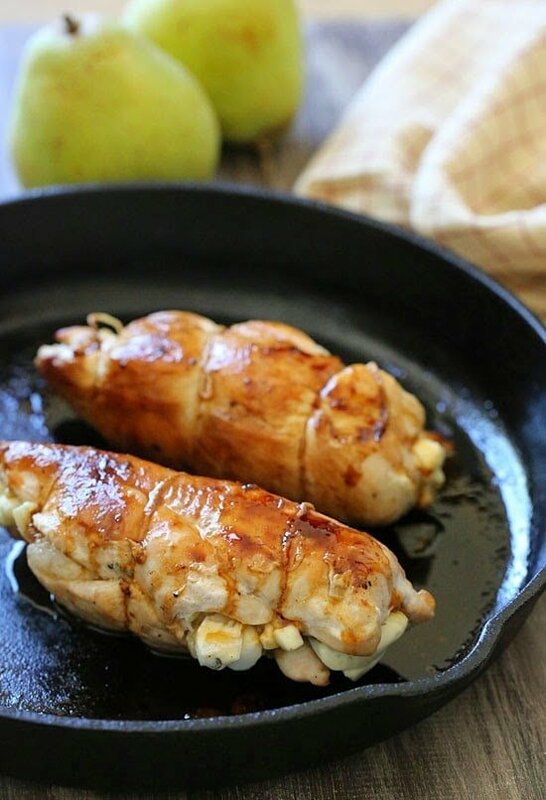 If I were to make them again- I think I would just bake the chicken breast and then top it with the filling and brie to make sure I got the flavors. substitute for the Royal Riviera pear???? I am not getting a shipment of Harry and David just for this. They must be backing this recipe??? I just made It with one of the cheep pears from the grocery store and it was amazing. I can’t seem to get the Harry & David blog website to open with the recipe… maybe they’re just having technical difficulties today? Just want to make sure I’ll have access to the recipe when I’m ready to make it later this week! Thanks, Gina! Fabulous! Made this for dinner last night and really enjoyed it. Slice the other half of the stuffed chicken breast into a salad for lunch today so I can attest to the fact that its great cold the next day. Thanks for a wonderful recipe. So excited to try this! If you go the lazy route and don't sear before putting in the oven, how does that change cooking time? Would you still suggest covering with foil? Thanks, Gina! I made this the other night and it was delicious! I had some brie leftover after making your cranberry walnut baked brie cups for a party (which were also amazing!!) and decided it was meant for me to try this recipe. I used smoked ham instead of prosciutto (because I had some on hand). I'm not sure what happened with the poster above who said it was tasteless, mine sure wasn't! Any ideas for sides. I wanted to make a special dinner for my husband and I and this would definitely do the trick but I don't want that to be all…. Help? This recipe looks heavenly! I gotta try it as soon as possible! Uhm, YUM!!! Wow this recipe looks amazing! Genius recipe. Pears, prosciutto + brie are a marriage made in heaven. Making this tonight and just got back from the store with all the ingredients. I got an error message as well and hoping it gets resolved by tonight! I don't think I can wait another night before trying this!!! I got an error message too when trying to access the full recipe. I tried to follow the link to get the full recipe,but get an error message. Any ideas to help would be greatly appreciated. I can never find arugula in my local grocery stores. Is there something that would be a similar substitute? I can't think that romaine would be close enough. Spotted this recipe this morning & it looked so good we had it for dinner tonight. Delicious!!! Only slight change we made was that we sautéed the onions & prosciutto in a mixture my boyfriend makes & always keeps in the fridge: salt, pepper, olive oil, lemon, garlic, & crushed red pepper in a food processor. Fantastic recipe, thank you! This looks amazing! I think I'm going to be brave and try this with apples – we just have too many apples right now and it would be silly to go buy a pear. This would probably work with apples, maybe. Haha only one way to find out! fontina, basil and prosciutto are fabulous too! husband loves! what about any type of a light sauce to put over it…maybe like a light white wine sauce or something??? Sure, I used the pan juices! Brie cheese and arugula is such a tasty combo! And stuffed in a chicken breast? Yum! Looks tasty but I literally only have the chicken in my fridge. Can we have some more simple (food we actually have on hand) recipes please? This kills me when people expect bloggers to create recipes specifically for what they have in their fridge! Can you even imagine trying to create a recipe for the items each individual reader might possibly have in their fridge at that moment?! Girl, you could rule the world if you could figure out how to do that! If you have a somewhat stocked fridge, these recipes aren't that crazy ingredient-wise, as long as you're willing to make a substitution. I can make a lot of her recipes without needing to go to the store, because I substitute. I don't have pancetta but I have bacon, I don't have arugula but I do have spinach, and I don't have brie but I have Muenster. So you only have Chicken and you want a recipe for "literally only chicken"
Where is the like button for this comment? Lol!! YUM!! 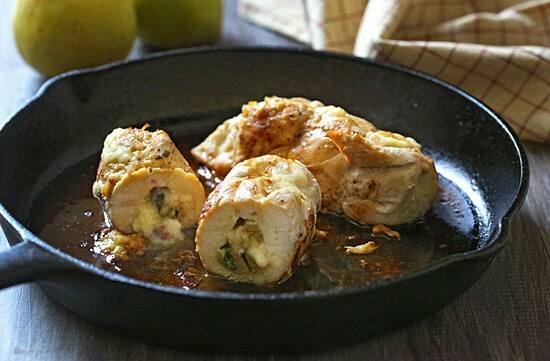 I love stuffed chicken! Could you sub center cut bacon for the prosciutto? What about goat cheese for the brie? Thanks for ALL that you do! Sure! No rules, use what you like! Any suggestions for pear substitute? Husband doesn't like them! Apples? @Lindsay….Seedless Green Grapes…fig…soft dried prunes or apricots…would all work to marvelous effect here..I am certain! My husband is also one who cannot take pears…WHY?! !…The melty brie (or camembert) would marry well with the alternative fruits methinks! Thank you Gina…as always…for providing such elegance with simplicity…The pleasure and health factors are consistently stellar. Can I substitute pancetta for the prosciutto? Any sugestions for a prosciutto substitute? Yes.,,,,,,, holy moly!!!!!!!!!!!!!! I made the stuffed turkey tenderloins — and that was to die for. Now this…….oh my oh my oh my. This is dinner tomorrow evening!!!!! Thank you Gina!!!!!!! !